That thunderstorm late Tuesday afternoon hit the Albany area with around 2 inches of rain (plus hail) in a very short time, causing flash flooding in parts of the city. If the Storify stream doesn't load above, here's the direct link. 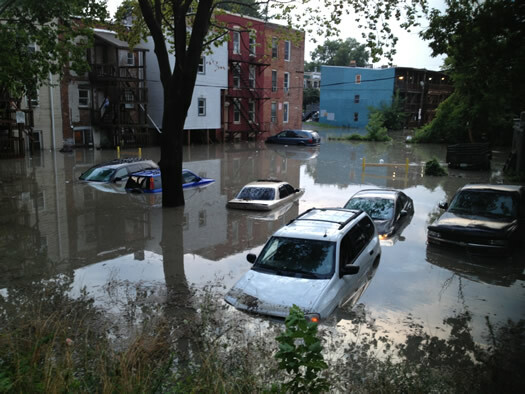 This sort of flooding has happened before and it will probably happen again because the Albany's sewer system is relatively ancient -- and it just can't keep up when there's so much water in such a short period of time. And that points to a larger issue: infrastructure. Albany and many other cities in this area are old, and at some point infrastructure like sewers needs to be upgraded or replaced because it can no longer handle the strain or is just simply wearing out. (Hey, a century or more is a good run for anything.) But: Where does the money come from? Albany and handful of other local municipalities are already looking at paying a combined $131 million to address the "combined sewer overflow" problem that results in raw sewage being dumped into the Hudson River (yeah, eww). And that situation highlights how expensive addressing these sorts of problems can be. Wow, these pics are wild - and at the time, I was driving through Colonie to Schenectady, with very little rain at all. I did hear the flash flooding alert from the National Weather Service on the radio, which said something like 'turn around, don't drown'. These pics certainly put that warning into perspective! Love the people in tubes floating, making the best of the situation - but the Times Union website had a pic of a dead rat in that area. YUK! Per my tweet that was included in the tableau above, NYS is set to receive $4.2 billion in settlement money which I think should be devoted wholly to infrastructure upgrades, specifically reinvestment in our urban core, mass transit networks and municipal solutions that reduce the need for storm water/waste management systems that are clearly ancient or pinched these days. I know folks will disagree, for taxes can never be too low, but I believe Cuomo has made good steps to help ease the tax situation in the state (tax cap, more progressive tax brackets, etc.) and now needs to refocus on our deteriorating infrastructure. And this does not mean we should rob Paul to help Peter, as Cuomo has recently done by raiding the Clean Water Fund to help build the new Tappan Zee Bridge, which not only robs NYC and the Lower Hudson Valley of critical monies for sewer and waste water system upgrades, but plows it into a bridge that does nothing to encourage mass transit options and everything to encourage sprawl or increased reliance on those sewer/waste water systems that are being neglected. If these flooding events and super storms are the #NewNormal, as Cuomo proclaims, why arenâ€™t we proposing smarter solutions in dealing with this new reality. I took a little walking tour of some of the areas that flooded. Part of the problem with the flooded spots along Elberon, Washington Park, New Scotland by Albany Medical, Myrtle at Knox, and the Lincoln Park gully is that they're all along the Beaverkill, the old creek was buried and converted to a trunk sewer years ago. Growing up in this part of the city, I don't recall ANY flooding this severe along that line. The one big thing that changed with this old sewer line is that the expanded Albany Medical Center connected lines to it within the past couple of years. The line was already ancient and outdated, but this new increase is more than it can handle during storms. Those two people on the inflatable tubes look as happy as pigs in... well, you get the picture. According to Scott Waldnam at Capital NY, some of Albany's sewer & runoff systems date back as far as the Revolutionary War era...and I for one am getting tired of my basement filling with raw sewage. Very glad we invested in a sump pump. "...for taxes can never be too low..."
Well, apparently they can be. I'm still amazed at just how localized this storm was - while Latham and downtown Albany were flooding I was driving from my office park near Crossgates over to Schenectady and there wasn't a drop of rain. My wife works in Latham and she texted me to say "don't go out in this," and I looked out the front window at the sunshine in Schenectady and replied, "out in what?" When the topic of CSOs and our aging infrastructure comes up, much (all) of the talk is usually centered on replacing the entire sewer system. However, another way to deal with Combined Sewer Overflow is divert storm water before it enters the combined sewer. We used to build with permeable paving surfaces, such as Belgian blocks and bricks. Those materials allowed for a good deal of water to pass through the street and be absorbed by the earth (and then re-enter the aquifer naturally). Asphalt doesn't do that. Look at all the asphalt parking lots in downtown Albany. There are companies that make permeable parking lot pavers. There are also engineering firms that create storm runoff "lagoons" and other natural devices to allow the water to be re-absorbed by the earth without having to enter the sewer at all (and they filter/"clean" the water naturally) ... and these techniques are less expensive than rebuilding all our combined sewers. Saw a lot of people splashing and playing in the flooding streets. Rich and Paula are right on the money. All of the $4.2 billion settlement should be used for infrastructure upgrades. This problem is not going to get better on its own. However, I guarantee you Cuomo will use a big chunk of the money for more economic development "incentive grants" which is simply corporate welfare. And Paula brings up an interesting point about Albany Med - is anyone checking on sewer capacity before permitting the hospital expansion? And if this happened yesterday, what is going to happen when they connect the Park South project to the system? Oh, that's right - the Park South project is really nothing more than a massive parking garage. So glad we threw people out of their homes and businesses for that. Jerry Jennings' legacy of poor financial decisions and lack of attention to infrastructure is going to live with us for a long time - and that isn't a good thing. Was selling baked goods at the farmers market on Delaware Ave behind the library; a bunch of vendors' tents got destroyed by the winds (including mine); the parking lot drain was insufficient to hold the water, we were standing in 7 inches of water at the end. Scary storm! So many streets flooded and trees down, power lines down as I headed home, unable to drive on most streets. I only saw ONE emergency vehicle (a police car on Hackett)--I guess the city was not prepared for this. I used the elevator in my building (corner of Henry Johnson and State) during the storm to get to the basement to do my laundry. When I got to the bottom, the elevator started beeping and, instead of the door opening, the elevator started filling with water. Pretty terrifying few seconds of my life, before the doors finally opened into a completely flooded basement. Needless to say, I took the stairs back up. @Duncan - I love this idea. However, these ideas usually just die out here in internet comment land... Is there an acutal project somewhere in the Capital Region - a parking lot that needs to be built or replaced, etc. - that we can rally behind and potential influence to consider these alternate approaches? I'm wondering if we can capture some of the energy here to make an actual chang, thus making it easier for future changes. Iâ€™ve been in touch with a regional planner, planners in Troy and the group currently working on the Comprehensive Plan for Troy regarding this matter and others. 3) The Troy comprehensive plan will address CSO and porous pavement. 5) The City of Troy has a difficult time convincing smaller parking lot owners to install permeable paving because of the cost and the maintenance. I have been told that those installations have to be vacuumed once a year so it doesnâ€™t just clog up. 6) The rain gardens, â€œlagoonsâ€, are much easier to convince people to build. 7) The Sustainability Task Force works to encourage owners of larger lots, like the Troy Plaza, to implement things like porous pavement. But what need is help to incentivize these projects. Lastly, while I agree some of these good ideas fizzle out in Internet comment land, these comments are an important part of the process. Personally, I donâ€™t stop at internet comments â€“ I also go to our regional leaders and stakeholders directly. But remember, the public consensus is a powerful force. â€œRegular folksâ€ need to be committed to this ideas as well. And sometimes it takes a cogent article in the media to sway that public consensus. Soâ€¦ keep the comments coming. A lot have cities have daylighted their buried streams and rivers with great sucess. Yonkers day-lighted the long-buried Saw Mill River in 2011. The results were a healthier river, a bit of nature in the city, and a booming neighborhood. It worked in Kalamazoo, Berkeley, Seattle, Seoul, and other places, too. I wonder if there are any opportunities for similar projects in our area.